The space has held a number of restaurants over the years, most recently Victory’s Cafe, whose sign is still installed above the awning. The entrance and layout of the restaurant is the same as the last occupant’s, but the decor is decidedly different. The walls are adorned with colorful license plates from states along the eponymous Route 66 and there are Route 66 signs and photos featured throughout. Upbeat 60s music plays over the speakers, and the waitstaff is friendly and welcoming. The menu includes standard breakfast and lunch fare, such as omelettes, French toast, pancakes, burgers, sandwiches, salads, and chili, and also some items that you will not see everywhere, like Breakfast Goulash (“scrambled eggs with sausage, bell peppers, onions, and tomatoes”), Granny Cake (“Texas toast dipped in sweetened batter and deep fried, then sprinkled with powdered sugar”), and a Hot Hamburger (“served on Texas toast with French fries, all smothered in gravy”). They also have a pickle bar and lots of pies and cakes for dessert. Prices range from $1.39 (for toast and jelly) to $11.99 (for a chicken fried steak dinner). Most items are around $5. We ordered the Western omelette with hash browns and biscuits and gravy, a bacon cheeseburger with fries, and a Granny Cake, (we had to see what a deep-fried piece of Texas toast was like). The omelette was filled-to-bursting with ham, cheese, onions, and bell peppers, and the hashbrowns were perfectly crisp and salty in all the right places. The doughy biscuits were the ideal counterpoint to the creamy, peppery gravy. The bacon cheeseburger featured a hearty and well-seasoned patty and came with all the fixins. The fries were the only ho-hum bit of the meal, but they were adequate. The Granny Cake, in case you are wondering, is like French toast on steroids, or a funnel cake that you eat with knife and fork and is smothered in syrup. This is definitely not something to order if you are watching your calories, otherwise, we highly recommend it! This is owner Randall’s first restaurant to open himself, but he has restaurants in his genes. His parents have owned and operated a successful diner in Henrietta for around thirty years. We hope he takes a cue from his parents and plants deep roots here. 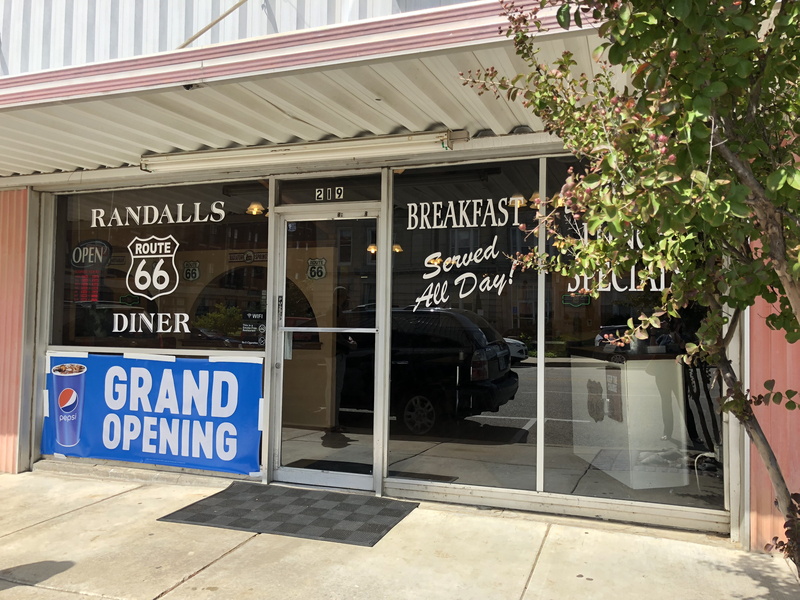 Randall’s Route 66 Diner is located across from the courthouse at 219 East Dewey Avenue. They are open Monday through Friday from 7 a.m. to 3 p.m. and are closed on Saturdays and Sundays. For more information, visit their Facebook page or call 918-347-8313.